Anthony's headline is wrong. It reads: "Yet another study shows Antarctica gaining ice mass – snowfall accumulation ‘highest we have seen in the last 300 years’". Then, that blogger who rejects out of hand almost every scientific paper he comes across, bemoans the fact that an article at Media Matters tells how a scientist, Jay Zwally, knew that deniers would twist his recent paper. …this new study jointly announced by the AGU and the BAS says that the gains in the 20th century for the West Antarctic are the “highest we have seen in the last 300 years”. The study's lead author astutely predicted that climate science deniers would distort the study, even though it does nothing to contradict the scientific consensus on climate change or the fact that sea levels will continue to rise. The second half of Anthony's headline is fine: "snowfall accumulation ‘highest we have seen in the last 300 years'", though only for a limited area between the continent of West Antarctica and the Peninsula. The first part: "Yet another study shows Antarctica gaining ice mass" is misleading. The area where the snow is accumulating is also an area where the glaciers and ice sheets are thinning. On balance, there's a big reduction in ice mass in West Antarctica and the Peninsula. The researchers found that in West Antarctica, on a coastal strip between the Peninsula and the continent, snow accumulation has increased a lot in recent years. There has been more snow build up in the past three decades than in any other time in the past 300 years. The new study used ice cores to estimate annual snow accumulation from 1712 to 2010 along the coastal West Antarctic. Until 1899, annual snow accumulation remained steady, averaging 33 and 40 centimeters (13 and 16 inches) water, or melted snow, each year at two locations. ...For the new study, researchers collected two ice cores from Ellsworth Land, the strip of land that connects the Antarctic Peninsula to the rest of the continent. The ice cores contain layer upon layer of ice – the remnants of yearly snowfall. By measuring the thickness of the ice laid down each year, the researchers estimated annual snow accumulation for the past 300 years. The recent heavy snow accrual appears to be part of a gradual, long-term rise in annual snow accumulation that started in the early 1900s and accelerated in the 1980s, the study found. The study’s authors found that starting in the early 20th century an additional 1.5 centimeters (0.6 inches) of water, or melted snow, was added to the ice sheet each decade. From 2001 to 2010, the amount of water added to the ice sheet each year was 15 centimeters (6 inches) greater than it was before 1900, according to the study’s authors. The close relationship between SLP [sea level pressure] and snow accumulation at these sites make this a unique proxy for past ASL [Amundsen Sea Low] (and onshore wind) conditions. The recent deepening trend of the ASL is predicted to continue through the 21st century in response to greenhouse gas concentration increases [Raphael et al., 2015]. The dramatic increase in snow accumulation in Ellsworth Land provides evidence that this recent deepening in the ASL region is part of a longer trend, observed as early as the 1920s, with acceleration since the 1990s when the coupling between ENSO and SAM [Southern Annular Mode] is strongest. The Amundsen Sea sector of the West Antarctic ice sheet has been losing mass in recent decades; however, long records of snow accumulation are needed to place the recent changes in context. 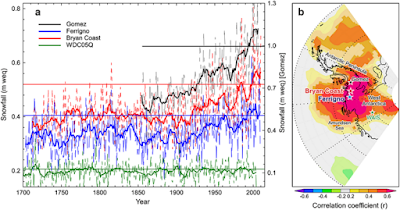 And if he'd read more about the Zwally paper, he'd have seen that they the authors found that snow accumulation had been declining (in East Antarctica), not increasing. The increase in mass that they reported was said to be from a decline in ice movement, not from an increase in snowfall. Antarctica is gaining mass from snow. In summary, local- as well as continental-scale changes in Antarctic accumulation rates show a remarkably linear relationship with local or continental average warming, respectively. Sensitivities from all four sources used here (ice-core data, palaeo-simulations, CMIP5 GCM future simulations and RCM future simulations) are positive. Palaeo-simulations as well as high-resolution future projections fall into the multi-GCM range of 6.1% K-1 ±2.6% K-1 derived from 35 CMIP5 models. Additional agreement with the sensitivities derived from the ice-core data provides confidence in projections of enhanced snowfall over Antarctica in offsetting the ice sheet’s dynamical contribution to future sea-level rise. In our simulations, at 5-km horizontal resolution, the region disequilibrates after 60 y of currently observed melt rates. Thereafter, the marine ice-sheet instability fully unfolds and is not halted by topographic features. In fact, the ice loss in Amundsen Sea sector shifts the catchment's ice divide toward the Filchner–Ronne and Ross ice shelves, which initiates grounding-line retreat there. Our simulations suggest that if a destabilization of Amundsen Sea sector has indeed been initiated, Antarctica will irrevocably contribute at least 3 m to global sea-level rise during the coming centuries to millennia. In other words, it might have already started. The comments were the usual mix of people not taking in anything of what they read. Ian Bryce seems to think snow falls out of a cloudless sky. Maybe he was confusing snow with cold. However in Antarctica, snow is more likely to be associated with warmth than cold (relatively speaking). Svensmark appears to be saying that with less cloud cover, the earth warms, but the Antartic is cooler because of the reflection of the radiation by the snow. So more warming means more snow. I’m convinced already. The hat tip to greenhouse gasses is still there, but they seem to be toning it down a lot. A cynic might think they have an eye on public opinion and are leaving themselves a way out if the CoCC (Cult of Climate Change) collapses. Ron has got it better, but does he realise that Western Antarctica is losing mass much faster than it's gaining it? So more warming means more snow accumulation which means more ice buildup and less sea level rise. I was under the impression that 97 percent of climate ‘scientists’ were Positive that they knew what drives our climate to the certainty that we just have to dismantle the progessmof the ages. But now we see yet another post the says they just don’t know jack. CO2 don’t do what they think it does. The alarmists are already working to spin this. In a warming world, the rise in temperature increases evaporation. The increase in humidity in the cold polar areas result in more snowfall. The models have predicted this all along. What on earth does MCourtney mean? Does he think that storms cause holes in the ozone layer? “Thomas attributes the higher annual snow accumulation over the last 30 years in part to an intensification of a regional low pressure system and more storms in the region. This finding is backed up by the snow accumulation. Which is actually very inconvenient for those who blame CFCs for the hole in the Ozone Layer. Out of curiosity does anyone know how Antarctica gaining mass will affect the wobble the earth has as it revolves. Doesn't Hansen 2015, not peer reviewed, find significant snowfall will eventually transition in this century from the continent to the ocean around it? *Survey* not *Expedition*. That was so last century (http://www.spri.cam.ac.uk/picturelibrary/catalogue/bae1910-13/). I think stormy223 should be hired by scientists as an editor. He actually translates academic goobly-gook into real English. Did any of Anthony's commentators read the actual paper? At sites like WUWT there seems to be a generalized lack of imagination or intuition as to how the collapse of an ice sheet could progress. Maybe because I've studied erosion and land forms it comes a bit easier to me, but I can readily visualize a large ice sheet both warming and (regionally and temporarily) increasing in mass as snowfall increases in a warming Antarctic. Ice sheets would become much more dynamic systems, with snowfall racing to keep up with increased sublimation, surface melt or ablation, and ice flowing faster to the sea along receding margins or ice "rivers" extending inland. Intuition does not equal evidence, of course, but it helps to picture physical processes that can then be spotted in the field or interpreted through modeling.